Situated along the strategic Meralco Avenue corridor, this 15 level, 7,000 square meter office building houses the headquarters of CYO, International, and the satellite offices of AGB Nielsen and Sky Cable Network among other tenants. 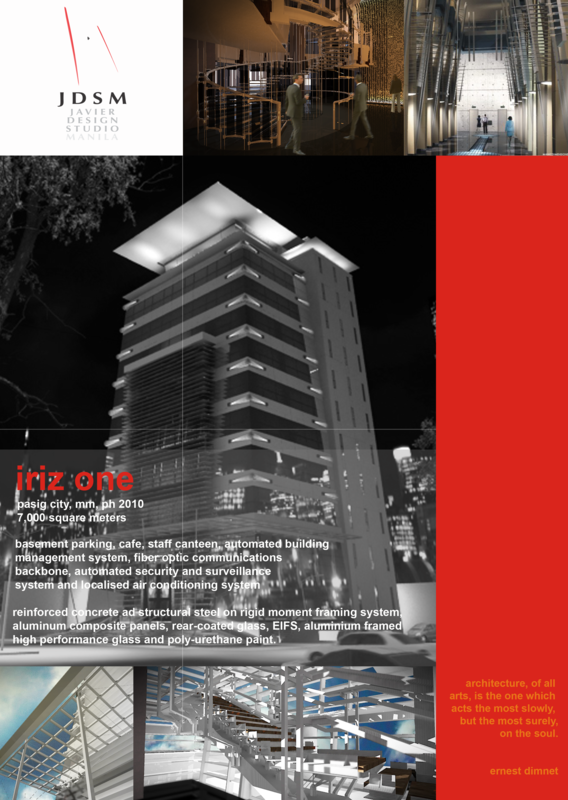 Designed in high Techno Modern style, this building was completed last 2010. Amenities include basement parking, cafe, staff canteen, automated building management system, fiber optic communications back bone, automated security and surveillance system and localised air conditioning system. Main structural materials are reinforced concrete and structural steel on rigid moment framing system. Architectural materials are aluminium composite panels, rear-coated glass, EIFS, aluminium framed high performance glass and poly-urethane paint. Project Managers are DAAbcede and Associates, with CB Richard Ellis as Property Managers. The design team is composed of GEOrigenes (STR), ITLegazpi (EE), CLMadriaga (SE and FC) and AFNavarette (ME).